It has been announced that a new television series of Alvin and the Chipmunks will debut in 2015. The series, originally called The Chipmunks and Chipettes and now titled ALVINNN!!! and The Chipmunks, has been in development since 2010. The new series is being created by Ross Bagdasarian Jr. (son of original Chipmunks creator Ross Bagdasarian, Sr.) and his wife, Janice Karman. 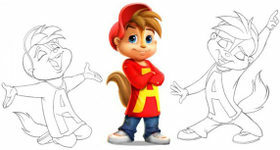 Produced by Bagdasarian Productions and French production studio Genao Productions, the series will consist of fifty-two eleven-minute episodes, and will feature the Chipmunks as CGI characters. This revival will be the first time the Chipmunks have been in a television program since Alvin and the Chipmunks in 1990. That's Alvin!? MiRoscoe! He's getting more little-human-boy looking all the time! I've had this in my playlist for years for some reason . . . well, no more reason than the rest, I guess. 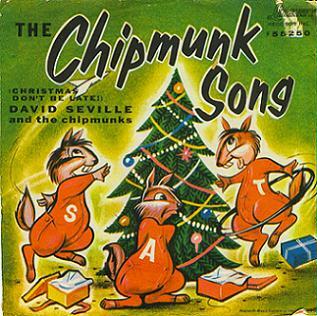 Fun fact: The Chipmunks are one of two groups who technically don't exist to have a number one hit song (theirs was "The Chipmunk Song: Christmas Don't Be Late," by the way; they had two, if you count "The Witch Doctor" as a Chipmunk song). The other was the Archies, with "Sugar, Sugar." The rumor was the song was so saccharine The friggin' Monkees turned it down for artistic reason, so they created a band out of some session musicians pretending to be the characters from the Archie comics; The Monkees connection is mostly a myth, and, hell, it is saccharine, but still catchy as all get out. There is a connection - Don Kirshner, who produced the first two Monkees albums and all of the Archies albums. The Monkees successfully fired Kirshner because they were promised but not given total artistic control of their material. That's why Kirshner made the Archies remain cartoon characters - so they couldn't rebel against him! The Archies albums were mostly session singers Ron Dante and Toni Wine, who wrote several big hit records in the 60's. Thanks for the "improvement" to my comment, but the link that I posted was to the original 1958 record album cover, where the chipmunks really look like chipmunks, not humans. My encounter with chipmunks: in 1966, I was carpooling with a group of Los Angeles s-f fans driving to the World S-F Convention, in Cleveland, Ohio that year. We stopped in Zion National Park one day about noon for a picnic lunch. There were signs all around the picnic area, "Do Not Approach The Chipmunks! They are carriers of bubonic plague germs!" Hah! As soon as we unpacked our sandwiches, the chipmunks poured out of nowhere, ran up our legs onto our arms and hands, bit our fingers to make us drop the sandwiches, dove off our hands to catch the sandwiches in midair, and were out of sight again with them in what seemed like less than a minute. None of us got the bubonic plague. The link still goes to the Wikipedia page featuring that cover. I reformatted it because it wasn't actually working as a link (Flayrah's URL parser still doesn't like parentheses). The video you linked, alas, does not use the original cover image. I've copied it from Wikipedia so people who don't click it understand what you're getting at. There are still squirrels with the plague. Some people even get infected. The Los Angeles Times publishes a warning every Summer about wild rodents in Southern California being carriers of bubonic plague germs. The warning is usually buried somewhere toward the back of the newspaper. Medicine for over a hundred years has had an effective vaccine against the plague that cures it in victims even after the symptoms appear. It's also a standard inoculation that you should get if you are in a part of the country where you can be expected to encounter wild rodents. Of course, you have to go to a doctor to get it. If I recall correctly, about 30 people a year throughout America die from it after refusing to go to a doctor. In the 1990s, Santa Monica, California had an infestation of gray squirrels that were notorious for causing traffic accidents by darting into the streets right in front of cars, causing them to panic-stop and get rear-ended. The municipal government was posting warnings and threatening stiff fines against anyone encouraging the cute squirrels by feeding them. At the UCLA campus and the Disney studio in Burbank where people did regularly feed the squirrels, they would come right up to people and tug on their pants or stockings to be fed. There was a scare in the 1990s in Colorado regarding prairie dogs carrying bubonic plague. I don't recall if any humans caught it, but I do wonder how many prairie dog towns suffered because of the warnings. Here is a fresh reminder that the plague germs are still spread worldwide, despite there being effective medicine against it today. The short story collection "Year's Best Sci-Fi 5" edited by David G. Hartwell (I believe it covered 1999) contains the story "Evolution Never Sleeps" by Elisabeth Malartre; it's basically killer chipmunks, though in a very hard sci-fi manner. It's more about how they would effect the eco-system (look away, owl fans) than people running from ground squirrels. Wow, 2015??? That's quite a long time, are they hoping memories of the live action movies will have faded by then? 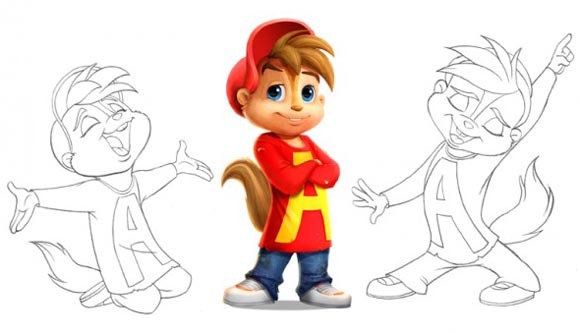 The artistic design of the chipmunks is interesting, I'm a little surprised they've increased the length of their tails while at the same time making them look... more human? I'm a fan of tails but the more human look to their bodies/clothing and faces is less something I would enjoy. It's a little weird but at first glance the new design reminded me of the current design of the Chuck E. Cheese character... but at least that one still looked like a rodent. I loved the 90's cartoon back in the day but I don't know if I could revisit the show at this point unless the writing is great - the animated movie was a fantatistic way to end the show. The less said about the live action movies the better in my opinion, though I'll concede this could only be a step-up from that at the very least. Ugh, meant to say "the more human look to their bodies/clothing and faces is less something I wouldn't enjoy"